For those who follow my blog know that I’ve been a big proponent of social media, but the problem is results and measurement. Airforce is doing something innovative with their agency and Volomedia. I really like this announcement from G4 and Volomedia. Volomedia has signed up a big publisher and a big advertiser to insert ads in portable media and video. The best part is that it work on ITunes and the Iphone. I’ve talked about this before around how iTunes (and IPhone) now has a business (revenue) model. Comcast’s G4 cable television network and Web site G4tv.com have begun working with VoloMedia to insert ads into the 300 podcast videos distributed monthly through about 23 feeds. The ad network began placing ads for the media giant last month, targeting young gamers.The U.S. Air Force placed the first ads in G4’s podcasts: Attack of the Show, X-Play, and Game Trailers. Sunnyvale, Calif.-based VoloMedia’s new vertical business, Video Game Podcast, supported the ad campaign created by GSD&M Idea City, the advertising agency for the Air Force. What Does This Mean? Why is this important? Vertical media works. The trend is away from individual sites or blogs but instead to ‘blanket the vertical’ with brand messaging. In turn effective reach in a vertical hits enough critical mass that brand equity translates. Said another way the most effective way to leverage things like blogs and podcasts is to ‘buy’ the vertical. The dynamics of social networking and social media create an opportunity to hit alot of people in the affinity group. What’s even cooler about this announcement is not only reach but measurement. This is a good move by the Airforce to get a vertical – here it’s gaming as the ‘contextual’ proxy for audience affinity. It’s a no brainer that gamers are their target audience, but instead of going for silo’d conversion, Airforce is going for blanket coverage in the vertical or affinity group. I predict this is the way the world will go very quickly. Vertical media advertising. This is a great program for brand advertising, and it has measurement. I am sure it will be a success. Web critic blog – Drama 2.0 has a post about the realities of Web 2.0. Not to toot my own horm but if you’re interested in Web 2.0 business models just read my posts from the past 2 years – the monetization answers are there. Here’s the conclusion that Drama 2.0 came up with – pretty right on. As we head into 2009 facing one of the toughest economic environments in decades knowing that the fun and games are over, it’s time to face the reality: the Web 2.0 we have today is not the Web 2.0 we envisioned a few short years ago. The most popular Web 2.0 creations have not been cheap to grow and operate. They’re still struggling to find revenue models that will serve as the foundations of self-sustaining businesses and even those startups that generate significant revenue in absolute terms (namely Facebook) cannot justify the valuations they’ve been given. And profitability is still largely a pipe dream. While it’s possible that Web 2.0 stars like Facebook, Digg and Twitter will turn things around, it’s quite clear that these companies are not like many of their hot Web 1.0 counterparts, which, despite having to battle challenges of their own, were able to develop viable revenue models and turn a profit relatively early on. Given all this, for Web 2.0 proponents who continue to make the same asinine argument, “Don’t treat Web 2.0 like Web 1.0!”, it’s 2009 and I concede defeat. Web 2.0 is not like Web 1.0. It’s in a special (ed) class of its own. I will be moderating a panel that is sponsored by Volomedia at NewTeeVee Live. It will be a workshop on content monetization at the NewTeeVee Live conference in San Francisco this Thursday, November 13 at 3pm. The panel is titled “Pennies Today, Dollars Tomorrow: Learn How To Make Money In The Media Transition As Television Moves To The Internet“. Pennies today, Dollars tomorrow. Learn how make money in the media transition as Television moves to the Internet. As content moves from controlled programming to a decentralized, multi-platform distribution model, solutions are required to engage, measure and ultimately monetize this audience. The session will explore this cross-over from television to online and devices, and discuss opportunities while maintaining control of your digital distribution for the anywhere, anytime audience. • User: Online content viewer, preferred method of consumption, how do you define good content? • Advertiser: social media, engagement, loyalty, conversion? Value proposition of content online? What is an example of a successful content franchise? Value of content or value of brand? Concept of a viewer? Is it the same as broadcast? Does the notion of a “viewer” matter online? Is there risk in being open or is risk overstated? Is there a ‘holy grail’ metric for content publishers? Engagement, viewers/listeners, loyalty, commerce, ..etc ? Content models: ad supported verses subscription – are there any other kinds? Business model: is it just promotion or is there a “there there”? What are advertisers looking for in the new tee vee environment? Role of brands? Is it about the brand? What works what doesn’t work? Audience engagement – what does it mean? Benefits to advertisers? When does an advertiser know when it’s working? Are there identifiable tipping points out there? How do they plan for future campaigns? Budgeting and media buying of the future? Here is a video of George Ruiz – Taken by Tim Street in LA. George is an agent and talent king and has been a successful film studio exec and negotiator. 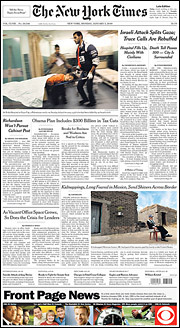 Today the news in the NY Times tells us about the future of online video and advertising. It comes as a shock to many people including Mike Arrington, Mathew Ingram, and others. With headlines from Wired like Hulu Celebrates First Anniversity, Gain Popularity By Serving Fewer Ads. Hulu’s success is due to the a great user experience verses forcing the maximizing of moneitization. That is why Hulu is not littered with Ads. Why? Because the content is the ad. SNL’s franchise on TV is their product and their online distribution (widgets) is their ad. NBC TV broadcast was the product and their online coverage was their advertising. Why do the big content people do this? This is going to sound too simple – they know what the users want. And their product (main content franchise) gets a reward for it – more viewers. Badda bing. Simple. How do you monetize: the plans for this new content model online will be different. Expect to see new contextual and behavior tools that serve users – a utility of some sort. For now it’s all about cross-promotion. Anything online that distracts users will lose – online experiences must be value-add. Advertising can be value-add and I expect new advertising solutions to be of value. I saw this from Caroline McCarthy at Cnet today and agree with this study. In the many years of research in online advertising and web 2.0 it is very clear that one of the roles a blogger plays in their area of coverage is one of newsmaker and analyst. I am shocked to see marketing people pass on sponsorship of the top influencial blogs in their sector. Yet pay 100k for an analyst firm to do some survey. Blog advertising and sponsorship is the best game in town for marketing executives. Here I posted about the Future of Blogging last week. Of course I’m biased but do see direct results everyday. Tell me if you agree?